Last night I was out for dinner, celebrating the birthday of my brother, at Roberta’s, the esteemed neo-pizzeria in Bushwick, Brooklyn. On the subway there my company was “Alone in the Kitchen with an Eggplant: Confessions of Cooking for One and Dining Alone,” a collection of essays from 2007 edited by Jenni Ferrari-Adler. 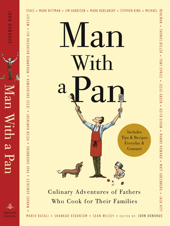 I bought the book a long time ago, when I was formulating the proposal for my anthology, “Man with a Pan,” but only now have I actually gotten around to reading it. Ferrari-Adler was in grad school when she came up with the idea for her book, and the essays skew young. Many are about being single and having to navigate the romantic labyrinth of one's twenties. It was, I realized, exactly where I would have ended up living if I was in my twenties and had just moved to New York City. Down a dimly lit street I sought the purposefully poorly marked entrance to Roberta’s, and as I entered the restaurant, I knew that if Bushwick was where I would have lived if I was young, Roberta’s is where I would like to reside right now. The smoky scent of freshly baked pizzas and the joyful cacophony of a crowd gorging themselves on the pies filled the front room. In the back, I found my brother and his band of merry revelers stretched out a long wooden table, tucking into salads of Bibb lettuce and meat and cheese plates. I sat down and tried a bit of the Verde Capra, a blue cheese made from goat's milk. I love blue cheeses, and it was irresistible. Plates of meat were passed around. I dropped some prosciutto on my tongue and felt it (and the worries of the day) melt away. Beer flowed from a plastic pitcher. Pizzas arrived—baroque affairs piled high with brussels sprouts and onion (the “Lionheart”), pork sausage and kale (the “Good Girl”), and portabellas (the “Porta Baller”; my favorite—I swear those mushrooms were laced with vinegar).